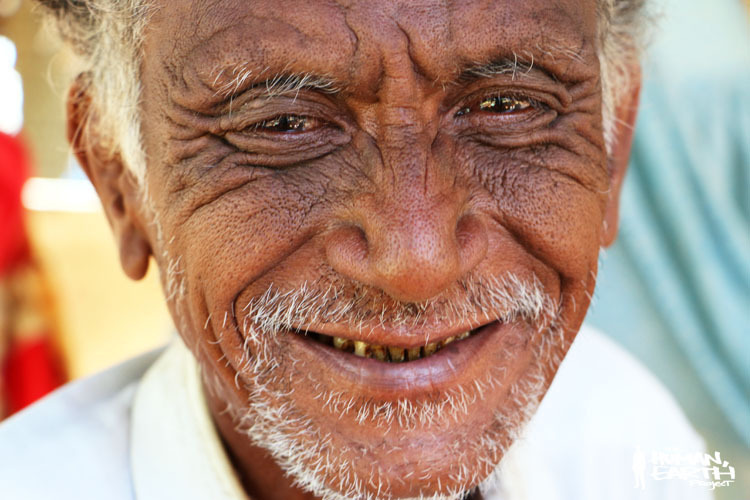 The hundred portraits of The Human, Earth Project dictate all we do. They control where we go, how we spend our days, and what we discover along the way. Moreno and I can travel thousands of kilometres for a single image. It’s an unusual collection, too. In some cases I deliberately excluded more engaging, technically proficient images, in favour of images I hardly even like at all. There’s this image, for example. Almost five years ago, here in central Myanmar, I climbed a stepped-pyramid temple to watch the sun set across the dusty plains. I was not alone. There were plenty of noisy white foreigners who came wielding cameras, snapping away at the sinking sun. And there was one small dark man, who slipped quietly up the stairs and sat beside me on the stonework. He was the only one amongst us who actually watched the sunset – without a viewfinder – as he smoked his cigar. As soon as the sun disappeared, so did the other tourists, but this man and I continued to sit in the last of the fading light. We didn’t speak, merely savoured the moment, then went our separate ways. I’d photographed the man in the dusk light. It certainly wasn’t one of my better portraits, yet I’d included it in my collection. Why? Because I was deeply curious to know more about this man. Who was he? A local peddler? A horse-cart driver? No doubt he’d watched the sun set from that temple a thousand times, weathering the endless tourist hordes as patiently as the stones themselves. 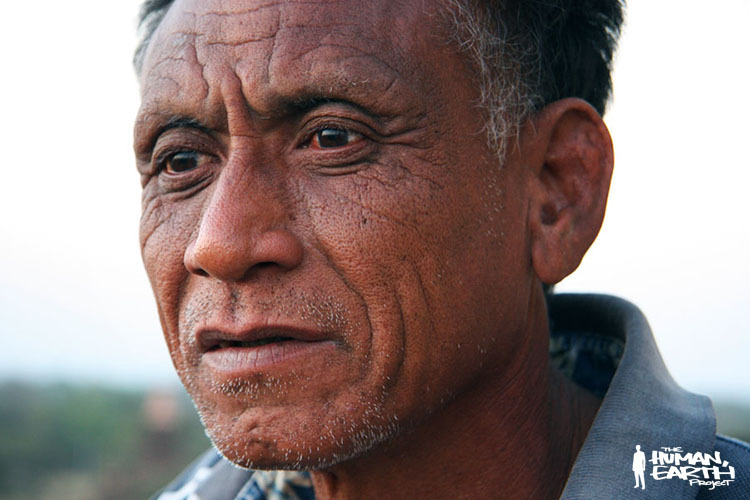 His name is U Kyaw Moe (“Oo Cho Mu”), and he’s a farmer. This week he’s busy with the peanut harvest, and then he’ll have little to do until the rains come again next April. He’ll spend his days relaxing, and planting trees. His daughters and son-in-law sell clothing and paintings to tourists, and they’ll take care of him. There are many more tourists now, his daughter tells us, but with the increasing prices of food and accommodation, they’re spending less money on souvenirs. Which is to say, the locals have all the disadvantages of mass tourism, with few of its benefits. Meeting U Kyaw Moe has been one of the more beautiful experiences of this journey to date. Moreno and I breakfasted with his family this morning, and have been invited to return for lunch tomorrow. In selecting the one hundred portraits for The Human, Earth Project, I was blindly choosing from a wide diversity of potential stories and experiences across Asia. I can’t help but wonder about all those other photographs that never made the selection. Walking in the streets and fields, seeing all the faces I never photographed concealing all the stories I’ll never have time to hear, it seems a lifetime is not enough.